You did everything right. You were persistent and with spotless records. Dedicated. Focused. The stakeholders found you by your merits alone, and the offer was... just perfect for you. A breakthrough with limitless potential teased your ambition to finally being in the center of a great discovery. Contracts and NDAs were signed, your biometrics authenticated and ID activated. The trip to the facility was a shock, not to mention the facility itself, and your quarters. It took some time to readjust, but you were prepared to start your work. At least that was what you thought until the first reports of system anomalies appeared. 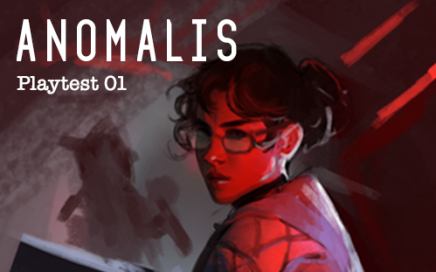 In Anomalis you take the role of a researcher trying to save yourself (and your work) during a catastrophic collapse in a secret facility. During play, you will investigate the catastrophe, defend your credibility and professional standing, and try to survive what's coming. Anomalis is a short-played game designed for one or a few sessions, ending either in a dramatic escape or death. It is a low-prep game, perfect as an impromptu or backup game when your regular game group isn’t present or when you unexpectedly get to play but haven’t the time or energy to plan and prepare yourself. It is inspired by and hacked from World of Dungeons, Sorcerers & Sellswords, the Year Zero Engine, and other PbtA-based games. Touchstones are among others videos games like Half-Life and Prey, along with moves like Zygote, District 9, The Thing, Morgan, parts from the Alien franchise, and of course, the old classics; Frankenstein and 2001: A Space Odyssey. Anomalis is in a late stage of development, and was publicly beta tested during the Gauntlet Con 2018, the first open live testing. If running a one-shot, pre-generated characters will help focus. Improvising around scientific subjects and contexts was harder than anticipated. The prep guidelines are too complicated and need to be condensed. A simple starting scenario with maps would help get an idea of where to take it.